That looks incredible! I can’t wait to give it a try :). A mutual friend, Matthew Letzelter, pointed me to your blog–it’s wonderful! glad you found it/me! I put this pesto in everything now. last night I put mixed it in to the custard for a quick savory bread pudding. another winner! 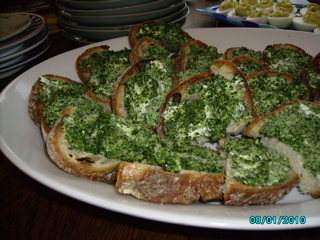 Parsley also makes a fabulous pesto – I made it last year with walnuts, garlic, & olive oil – it’s been a big hit with everyone. I also put it in stews and soups with great success. Thanks for expanding the repertoire even further! Just made this with almonds and tuscan kale from my garden. It never occurred to me you could make pesto with something other than basil! It’s delicious and, I think, going to become a regular here. Thanks for the report Brenna. It’s a great use for all that wonderful kale, chard, beet greens, etc. glad you liked it. Hava I mentioned how many times I have used this recipe this long long winter? Pesto – it’s not just for summertime anymore. 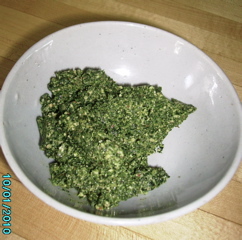 Pesto Recipe with Kale or other Winter Greens – Yum!